So, you know how couples can sometimes start to morph into each other after a while? They claim it’s just a cute coincidence that they love the same music/movies/style/skinny jeans but really, their creepy clone-like behaviour is a direct result of spending too much time together. Well apparently it happens to 20-something girls too. 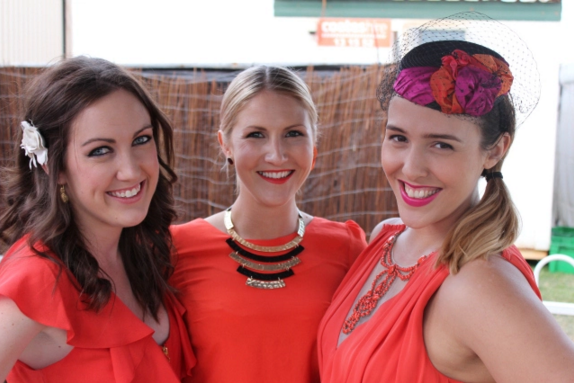 Last week at the races two friends and I accidentally turned up wearing a ridiculously similar shade of orange. All day people asked if we had synchronised on purpose, or they said we looked like bridesmaids. It was a real “And on Wednesdays, we wear pink” Mean Girls moment. Only with tangerine. Thankfully we were able to have a hearty laugh at ourselves. Have you ever turned up somewhere in the same dress or outfit as someone else? 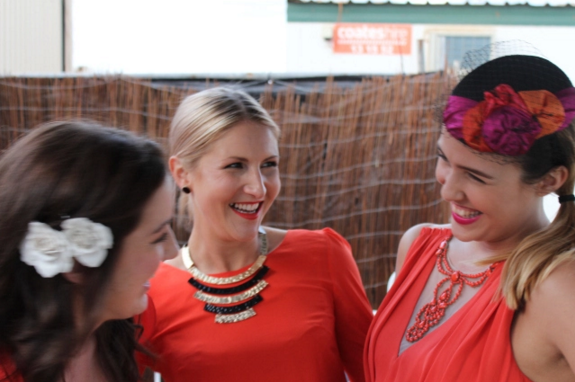 This entry was posted in Fashion and tagged Dress, Fashion, Faux Pas, Orange, Races, style. Bookmark the permalink. Same dress in the same tent @ Kal Cup! I had to stop wearing my favourite Perri Cutten jacket to work for about a year as this obnoxious, braying woman joined the organisation complete with same jacket that she wore just about every day. I had to wait until she had sufficiently faded from people’s memories before I could start wearing it again. Nightmare! A very similar thing happened to me involving a coat and a girl at uni… It was a different colour to mine but still. Never wore it again.